As anyone who knows me will tell you I am competitive. I’ll race you to the bathroom. Given that my career in academia involves a lot of murky judgments on what’s good and what’s not I appreciate the purity of racing. It’s clean. Everyone knows who’s skilled and who isn’t. Cheating is despised. But best of all is the camaraderie. It’s common to see rivals working together before a race. Though you may get run over once the flag drops competitors tend to be supportive and generous off the course. Honor, integrity, the pursuit of excellence and teamwork mean something in racing. In the rest of the world, I don’t know – maybe not so much. 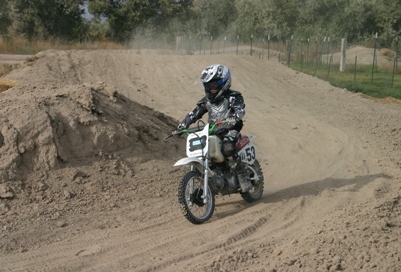 As my son, JR has developed an interest in motorcycles through the years I’ve played down racing. But as JR got his first taste of organized competition in Campfire Flag Football last summer he started asking about it. 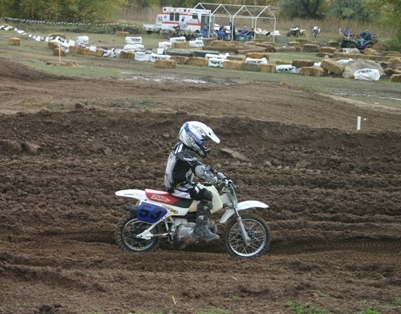 So for his eighth birthday I promised that I would take him to a peewee MX race and let him compete. 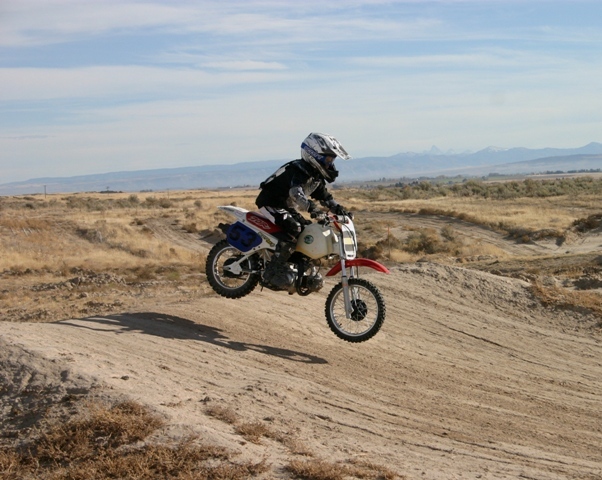 Grandpa Moon came up with an old Honda XR70R that JR and I spent much of the summer restoring to life. 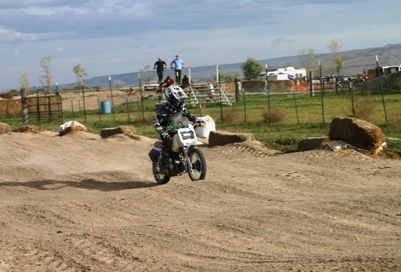 Finally, on his birthday, JR and I went to an open track day at Cache Valley MX near Preston so that he could get a feel for what a race might be like. 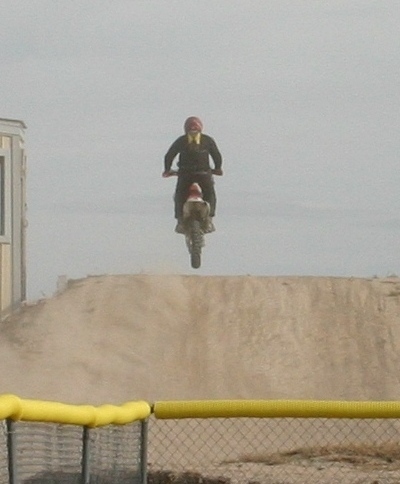 Five years ago, upon waking up in an ambulance speeding toward a California hospital, it occurred to me that I’d probably completed my last race lap on a motorcycle. I was lucky that the worst I got from a 100+ mph road racing get off was my bell rung, prodigious bruises and some torn rib cartilage. My two teammates also experienced terrible mishaps on the same day and the final outcome was a colossal hospital bill, several destroyed motorcycles, the financial collapse of our sponsor, a divorce and bankruptcy. It just didn’t seem worth it anymore for the occasional twenty dollar wood and plastic trophy I’d earned. So when JR threw down the gauntlet I found myself in the middle of a conundrum. As a recovering addict I’d sworn off racing as impractical and expensive and come to terms with it as my personal opiate. Beyond that, at the age of 54 that ground is starting to look mighty hard from the height of a motorcycle seat. Left to my own devices I’m pretty sure I’d have been satisfied with racing stories (of which I have no shortage). But I got called out by an eight-year old. What are you going to do? 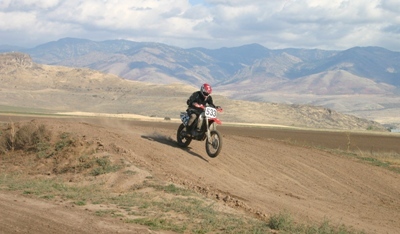 So JR and I slapped numbers on our bikes and headed down to Cache Valley last weekend for their annual Grand Prix. And son of a gun if JR didn’t go out in his very first race and bring home a first place trophy – soundly trouncing his old man who maintained a solid grip on last place in his class. 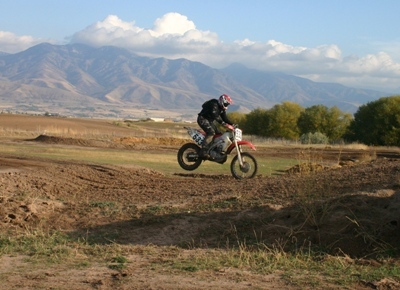 Dad - the experienced racer on a fully-built CRF450X - got spanked by an eight-year old on a hand-me-down XR70R who didn't even shift up into third gear. Humiliations galore. Aside from the fact that I now have to listen to an endless stream of race advice from an eight year old - with exactly three laps of competition under his belt (my favorite: “You know dad, they don’t hand out speeding tickets out there.”) - I am pretty amped about this whole change of affairs. Watching JR walk up at the awards ceremony and claim his trophy was far and away my most rewarding experience in racing. Beyond that I’d forgotten how much I enjoy the smell of race gas, the scream of an engine near redline and the bucking and twisting of a bike being thoroughly wrung out. Dirt racing is much cheaper than road racing and my new teammate is my son. It just doesn’t get any better than that. So Team Hillbilly/No Worries Racing is back. We are off to Rock Creek MX this weekend for our next race. Plus I have to win back my favorite pit chair from JR – the rocker. 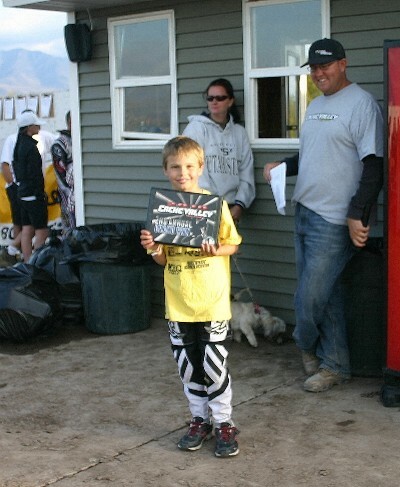 Cache Valley MX Grand Prix: JR 1st 7-8 Peewee, Martin 7th Ironman.